“Two households, both alike in dignity, In fair Verona, where we lay our scene, From ancient grudge break to new mutiny, Where civil blood makes civil hands unclean. From forth the fatal loins of these two foes, A pair of star-cross’d lovers take their life. . .”, William Shakespeare, Romeo and Juliet. Looking to spend the most romantic weekend of the year in the perfect location? Well, then Verona is the place to go. 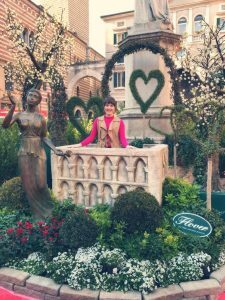 From Shakespeare to the charming city views, there was not one disappointing detail about my trip to Verona on Valentine’s Day weekend. Sunday, 4:32am: The alarm sounds in our apartment. No one moves. But, then as if we’re on the same wavelength, my two roommates and I all rise from our beds. I flip on the light. “We’re going to Verona!”, I say with disbelief. We all squeal in unison and then ready ourselves for the day we’ve been waiting for since we planned the trip two weeks prior. Sending my letter off to Juliet. Think she’ll write back? 6:00 am: The three of us stand in the drafty Bologna station where we have been waiting for our connection to Verona for almost an hour. We are cold, hungry, and caffeine deprived. I think I catch a whiff of freshly ground espresso but, there are no available café’s in site. I attribute the phantom scent to wishful thinking and continue to stand and stare out the doors at the empty train platform before us. Antsy, we decide to brave the cold morning air and head out to find our next train. We shiver as we walk out along the empty tracks. There it is again. That beautiful scent. But, where is it coming from? Then I see it. A soft glow and the humming of gentle conversation pour onto the uneven bricks before us. “Look, a café!”, I proclaim. We have time to spare so we head in, order three cappuccinos and two croissants. The barista hands us our go-cups with a twinkle in his eye. 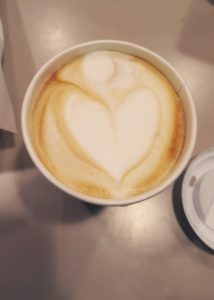 “Aw, a heart!”, my roommate Audrey exclaims as she points to the designs in our cappuccinos. Relaxing by the river, enjoying the sun and the cute ducks. 8:32 am: Verona Porta Nuova is quiet. Not too quiet, but quiet enough to make it feel as though we are some of the only few awake on a Sunday morning here in Verona. Unsure of where to go, we ask Siri to take us to the city center where the Verona In Love Valentine’s day festival is to be held. We walk for about a mile. 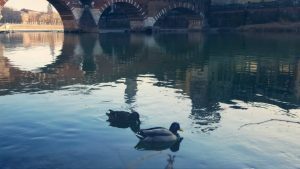 On our short journey to downtown Verona we are met with a serene northern Italy scene of fountains that sparkle in the early morning sun, birds flying above us in the light blue sky, and then. . . a massive horde of marathon runners that are coming straight toward us? Confused and surprised, we take a step to the side to let the group pass us. “Ooh, it’s the last day of the festival. So, they must be a part of the Romeo and Giulietta half marathon,” Audrey informs us. Tara and I nod in remembrance as we watch these ambitious Italians run by. A steamy cup of foreshadowing for the day ahead of us. 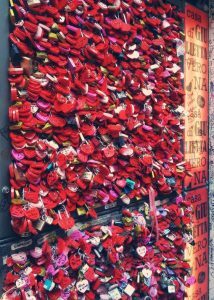 . .
Heart shaped locks fill this iron grid on a wall across from Juliet’s Balcony. 10:00 am: The crowds in Verona start to pick up. 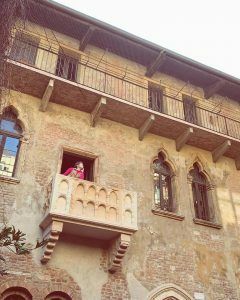 So, after our brief dalliance through the heart shaped maze that fills Piazza dei Signori, we head out to find Juliet’s House, ready to stand in the famed balcony. Following the heart shaped lights strung between the buildings above us, we soon arrive at the entrance to the courtyard of the house. 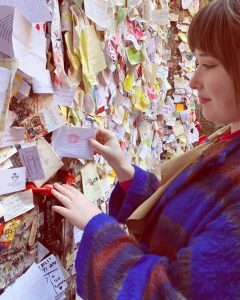 We walk through the archway whose walls are covered in signatures and chewing gum. The courtyard is smaller than I expected. At the back I see a bronze statue of Juliette whose breasts are being cupped by a tourist as he poses for a camera. “It’s supposed to be good luck,” Audrey says after she catches my confused expression. The line to the statue fills the courtyard, but we make our way in and look up in wonder at Juliette’s balcony. “Oh my gosh! There it is you guys! Juliette’s Balcony!” Audrey exclaims in wonder. She then quotes Shakespeare with, “But soft, what light through yonder window breaks? It is the east, and Juliet is the sun.” Which sets the scene perfectly as we watch a couple in the balcony posing with a kiss for a camera down below. In the center of the maze a replica of Juliet’s balcony was set up for a chance to take a cute picture! 10:30am: As we wait for Tara to come out onto the balcony so we can take her photo, I use Audrey’s shoulder to write a quick letter to Juliet. I fold it up and seal it with a kiss. Audrey snaps a few pics of me as I slide my letter into the wall behind the statue. We reverse roles, then continue to wait for Tara. After watching a whole family pose with the bronzed Juliette, Tara finally comes out. Grinning from ear-to-ear she leans on the balcony’s edge as Audrey captures it with her iPhone. Tara disappears back into the house and is out a few minutes later. We trade off. 10:45am: I stand in Juliette’s balcony, throw a couple of quick poses including one that mimics the pose our dear friend, Juliette the Statue. Feeling as though my life is now complete, I be-bop back into Juliette’s House. 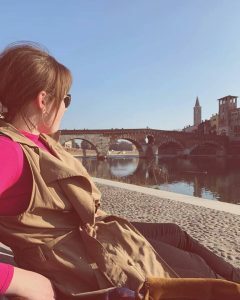 Bridgette is a spring 2019 SAI Florence student from Washington State University.